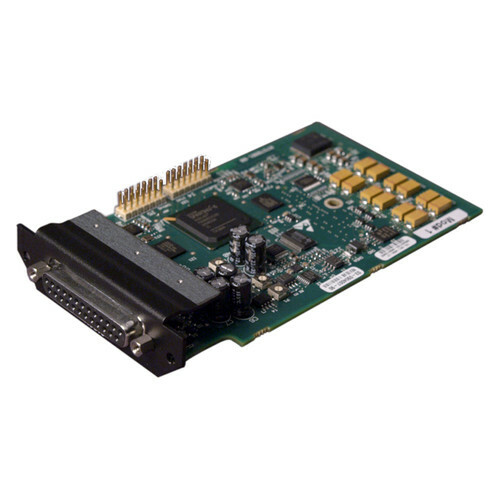 The ImagePro-II Audio Module Upgrade Kit from Barco is an audio mezzanine board that gives you access to embedded audio from the video input signals with your Barco ImagePro-II series converter/switcher. The mezzanine board features a DB-25 connector, providing an I/O interface for four analog and eight AES digital channels. You can select and use the embedded audio from the video input source signal, or from the analog or AES digital signal from the DB-25 connector. The de-embedded HDMI, DisplayPort, and SDI input audio signals can also be selected to appear on the discrete analog or digital AES outputs. Note: The ImagePRO-II Audio Breakout Cable is required to access the analog and digital AES signals from the DB-25 connector. The breakout cable provides four XLR connectors for analog audio in/out, and eight BNC connectors for Digital AES in/out. Box Dimensions (LxWxH) 25.8 x 24.8 x 8.5"